When you’re grouse hunting it seems like you can hike forever without seeing a single bird, and in a split second that can all change. As we mentioned in our grouse hunting tips article, it’s critical that you know where to find grouse in your area so you can be prepared when you do flush one. 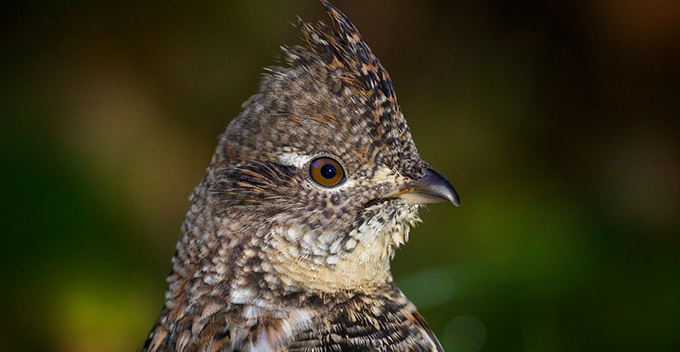 There’s no way you’re going to be able to remain constantly ready with two hands on your gun ready to shoot during a 4 or 5 hour hunt, but if you know how to recognize areas with a high chance of holding ruffed grouse you will be ready when you bump one. Keep reading, and next time you go out you’ll know exactly where to hunt grouse. If you can confidently know these 4 things (and let’s face it, if you can’t answer the first three you probably shouldn’t be hunting anyways) you can also confidently come up with a solid plan of action. Even the best plans don’t work from time to time, but we’re talking about increasing your chances of finding birds, not guaranteeing you get your limit. Easily the most dynamic part of the four items listed above, the weather is going to factor into where the grouse are located on any particular day. For example, if it’s a dreary, rainy day they are most likely to be clumped up in pine or spruce trees attempting to stay dry. We could (and did) write a entire article based on how the weather effects where the grouse are going to be, and you can read up on it in more detail here. Knowing where to find grouse during any particular time of day gives you an absolutely massive advantage over other hunters when it comes to bagging a few birds. Even though they aren’t often compared to deer, it’s remarkable how similar their daily cycles are. Just like deer, grouse transition from the bedding/roosting areas in the mornings, to feeding areas in the afternoon, back to bedding/roosting areas in the evenings. If you know the area you’re hunting well enough, you should be able to get in there and catch the grouse in these areas throughout the day. Just like deer hunting, it’s critical that you know the type of habitat that you’re hunting so that you can maximize your efficiency while you’re in the woods. This shouldn’t come as much of a shock at all, but food sources for grouse are constantly changing throughout the year. This is going to force you to adapt to where to hunt grouse as the season progresses. Just like the weather, this is such a big topic that it justified its own article. You can learn more about how the time of year effects what grouse eat here. Back to the deer hunting comparison. You need to know what types of habitat you have available to you so you know where to find grouse. A good example would be the 40 acres we own in northern Wisconsin. We know that our land has great thick cover with lots of aspen & poplar trees as food sources, but not much in terms of roosting areas for the grouse. Knowing this, we typically don’t waste our time hunting this section in the early mornings since the grouse are less likely to be there. Instead we go to some public land that has some excellent transition areas for early morning & evening hunts. Where to Hunt Grouse – Now You Know! You now know exactly how to pinpoint where the grouse in your area should be. Keep in mind that just because you are in a spot that should hold good numbers doesn’t mean that you’re going to get your limit every time. Take it from a man that has missed more than his fair share of birds – finding them is only half the battle!